Any thoughts of selling the case by itself for jplay customers that have already purchased the Intona? I really like the look of the JCAT case, and not a fan of the '70s look of the Intona case. I've decided to offer the JCAT USB Isolator's case to JPLAY customers at 99EUR including shipping. Please send an email if anyone is interested. After reading through this thread I have become very interested in purchasing a JCAT USB Isolator, but there have been no replies here for over 2 months and this causes me some concern. Is there another thread on this site which I have overlooked with more end user reviews? My other questions would be as to whether or not the JCAT USB Isolators are still available and are you currently shipping to the United States? Maybe it's because it's a "rewrapped" intona, which has been discussed in depth in many forums. The jcat version for the same price offers a better alluminium case. It solved an annoying groundloop problem in my setup and improved sound. keyer75- I had been following the excellent reviews of the Intona USB Isolator on the Computer Audiophile forum ever since last year, but it wasn't until I learned of the JCAT version with it's aluminum case that I finally decided to get one to place between my Mac Mini and SOtM DX DDC. I'm looking forward to joining the ranks of the many end users who are very satisfied with the sonic improvements that the JCAT USB Isolator can bring to computer audio playback. I do have a question for you. Initially I will have a 1M UPOCC Silver USB cable between my Mini and the JCAT USB Isolator and then a 1.5M UPOCC Copper USB cable connecting it to my external 9v LPS powered SOtM DX DDC. I plan on eventually getting a 6" UPOCC Silver USB cable to replace the 1.5M length. I am hoping that the longer 1.5M USB cable will not be too long for the application to work adequately to handle data transfer until it can be replaced with a much shorter cable. Based on your experience what would your opinion in regard to this situation? Based on your experience what would your opinion in regard to this situation? I have limited experience on usb cables, I can tell you I never used cables longer than 1.2m but I think that a good a 1.5m is indistinguishable from a shorter one to most hears and shouldn't give you any troubles on connections (if it is good, again). Hi ! Got the isolator! Worked perfectly, . More cleaned up, more nuances. Quiet. No brainer! Maybe more effect as usb cable in that price range. My digital audio playback hardware and cabling consists of a Mac mini with a 3.0 Mhz Core i7 Dual core processor, 16GB RAM and a 256GB PCIe based SSD running El Capitan > Moon Audio Silver Dragon USB cable > Theta Digital LPS powered SOtM DX-USB HD DDC > Audio Sensibility UPOCC Silver digital coax cable > Wadia 151 Power DAC. For almost 2 years I had been considering one of the many often released options to clean up and reclock the USB audio signal coming from the Mac mini to my DDC, but most of them required an additional high quality linear power supply and I just didn’t want to go down that rabbit hole. My attitude began to change earlier this year when I first read about the self powered Intona USB Isolator and all of the great reviews it received from end users. Over he next few months I read several accounts on Computer Audiophile website reporting that added EMI/RFI shielding of the plastic case of the Intona yielded even better sonic results. By the time that the JCAT USB Isolator in it’s sharp looking aluminum enclosure was released a few months ago I felt that I had just possibly finally found the best self powered solution to clean up and reclock the USB audio signal from my Mac mini. It was an almost 6,000 mile long trip for the JCAT USB Isolator to where I live here on the left coast of the United States, but it was definitely worth the wait. 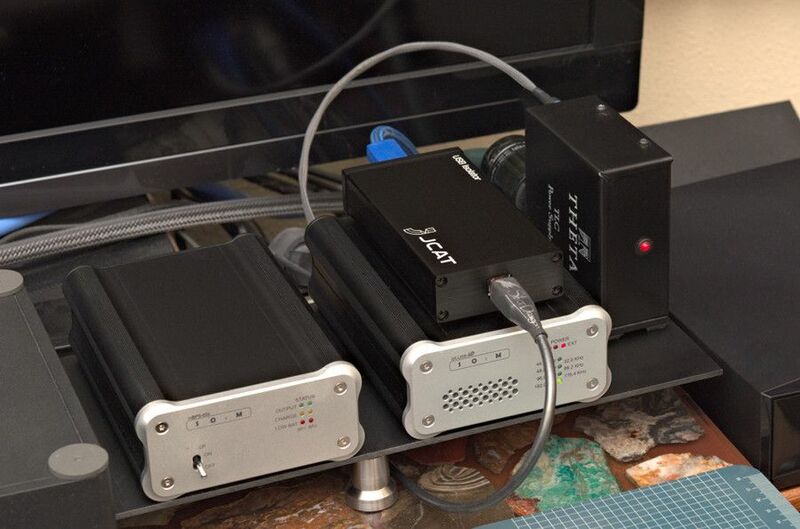 For it’s initial setup I placed the JCAT USB Isolator on top of my SOtM DDC which sits on a Stillpoints isolated sheet of Dragon Plate carbon fiber along with it’s 9v Theta Digital linear power supply and a SOtM MBPS d2s battery power supply. The Moon Audio Silver Dragon UPOCC USB cable was used to interface the Mac mini and the JCAT USB Isolator while a Furutech GT-2 OCC Copper USB cable was the only decent spare USB cable that I had at the time so I used it to connect the JCAT USB Isolator to the LPS powered SOtM DDC. After reading 100’s of accounts from other Audiophiles who had written reviews of USB devices with a somewhat similar purpose on the AA and CA websites I didn’t know what to expect from my new JCAT USB Isolator in my particular digital audio system. Installation was a plug’n play breeze and the JCAT USB Isolator immediately began doing it’s job while playing my music which collection primarily consists of classical music in the string quartet format. I am a confessed detail freak and the sonic improvements which the JCAT USB Isolator brought were immediately apparent and and effortlessly noticeable. In contrast about a year ago I experimented with a pair of Jitterbugs and I found myself repeatedly inserting and removing them in an attempt to evaluate their effect where by comparison the JCAT USB Isolator immediately had an undeniable and easily describable positive effect. The particular improvements which the JCAT USB Isolator has brought to the sound of my USB audio playback of the very simple acoustic music that I like to listen to has been to remove the elements which I have come to know as noise and leakage currents which among other effects were causing the sound of instruments to blend together. Through the JCAT USB Isolator’s galvanic isolation these sonic images are now being rendered as clearly and cleanly separated one from another which results in giving each of the instruments an newly rock solid and individuated placement within the soundstage. In addition the leading edge of the musical notes are now much more distinct and detailed with an increased energy to them than I have ever been able to hear before from these recordings which I have been listening to for many years. I have also noticed that the decay elements in the music have been freed up and are now able to sustain for surprisingly longer periods of time giving the music playback more of a welcomed and satisfying ‘live in the room' quality. In short, I have yet to play a piece of music that the JCAT USB Isolator wasn’t able to help sound substantially better than it ever had before in my audio system over the last 16 years since I got my first DAC. My personal conclusion: With it’s highly effective galvanic isolation, convenience of use and outstanding aesthetics the JCAT USB Isolator has successfully become a very much appreciated addition to my computer audio playback system which has allowed the $1,000’s in equipment and cabling investments which I have carefully made over the years to perform in an improved way thus becoming much more effective than they were being allowed to before this game changing new addition. Thanks for the extensive report! I received today the usb card and the Isolator, but soon as insert isolator in the chain there is no more music! The "chain" looks this way: JCAT usb Card => usb adapter (or cable) => Isolator => JCAT usb cable => Sonicweld HR. I'm powering the femto usb card with 5v, directly from my big ATX Teradak PS, via DC jack connector. Check if USB stick is visible first. If it is then it means setup is working, the problem may be elsewhere. Perhaps the Diverter needs more current than the USB Isolator can provide? The usb stick is working and since Diverter needs a bit more than 300 mA (and less than 500 mA) it should also work! What I'm gonna do now?!! Check different USB Cables. Josef is using both the FEMTO card and Isolator with Diverter HR (same setup) and said not all combination of USB Cable work.. Thanks Marcin, but I tried a couple diferent usb adapters and a cheap usb cable, between FEMTO and Isolator, and JCAT usb cable between Isolator and Diverter. I don't have another good usb cable to replace JCAT! The last option would be to make usb spliter adapter and power Diverter directly! Do I need the ground(-) on the D+ and D-, or no? Try moving or pulling the USB cable just a little out of the USB socket on the JCat card and watch for the green LED light on the Isolator, hopefully the Jcat casing has retained the Green Leds near the sockets. I spent several hours with my Femto card trying to get it to lock to the Isolator before discovering that my PPA USB cable needed some adjustment to get it to pick up the 5v connection. The original JCat USB card works every time with the Isolator when I put it in the chain with the PPA USB cable but the newer card has slightly different USB sockets, they look better quality but the connection does not seem to work as well with the PPA USB cable connector. Thought I had a dud card first but after persevering i finally got everything working. Audio PC - Gigabyte H97M-D3H & PPA OCXO Mobo, Teradak ATX Linear for 20 pin ATX on Mobo, Paul Hynes SR7EHD 12v for Mobo, 5v for clocks & 5v supply to Audiowind Regulator for 1.3v to RAM direct, JCat Femto USB Card 5v from Paul Hynes, Startech Lex – Amber Regen to JCat USB & Startech Rex to Lex by 2x Meicord LAN through GISO GB Isolator powered by Teddy Pardo 18v Linear, Wtfplay off USB on REX – remote control by Mele F10, D to D - PPA Red USB Cable - Intona - LFP 3.3v battery powered USB Regen – Isolated Xmos 768kHz USB DDC powered by 2 x 3.3v 0.8uV Linear Regs – i2s - D to A - Lampizator Big7, Conrad Johnson Premier 17LS, Classe CA 2200, Raidho C1s. Recent changes in red. Thanks for the input Pearse. It's interesting that the Sonicweld lights up, but no sound! It might be then that the data connection somewhere on the USB is bad! Like I said, try different USB cable. Maybe that will fix the problem, but it's not like a have a dozen of usb cables and can switch them until it work! I only have the JCAT usb cable and a couple of "printer" cables and usb adapters. With what I have, I tried all the combinations that came to my mind, tried to pull, move the connectors, but nothing change!